It started back in 1956, in this actual storefront location and was originally called Mike's Subs. 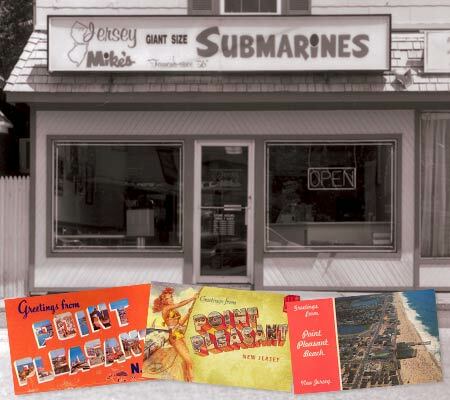 Mike opened the small shop in the sea-side town of Point Pleasant, New Jersey. You have to remember that in 1956, there were very few franchise restaurants or hamburger chains. No chain pizza, chicken or taco restaurants, either. In 1956, proprietors of mom-and-pop businesses would open their stores in basic storefront locations like you see here. To survive and thrive, they had to offer exceptional quality products, coupled with unparalleled service. In 1956, Mike was unique in that the product he was offering was a relatively new item in American society – the submarine sandwich. Mike also benefited from the geographic location of his store. Point Pleasant, New Jersey is centrally located in the state on the legendary Jersey Shore. It is approximately 1 hour south of New York City, 1 hour east of Philadelphia, and about 3 hours north of Maryland, Delaware and Washington, D.C. For over a century, the people that lived and worked in these metropolitan areas would flock to Point Pleasant to experience the sun, surf, sand, boardwalk, salt water taffy, and all the treasures that made up the legendary Jersey Shore experience. 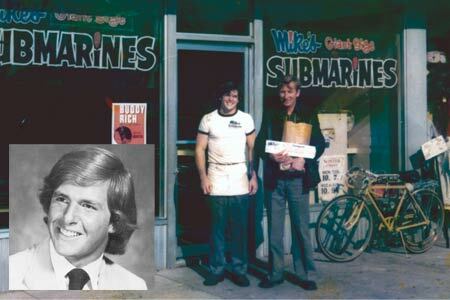 Mike capitalized on the influx of vacationers, visitors and local residents by offering them his unique new product – submarine sandwiches. But what really differentiated his restaurant was the experience he gave his customers. Recognizing them by name, and knowing the sandwich they were going to order, because of their frequent visits. People would line up throughout the summer to buy the sub sandwiches that Mike was selling, and to enjoy the experience of coming into his shop. For over half a decade, he built the business into a thriving landmark, and was a pioneer of the authentic subs sandwich. In 1971, Peter Cancro was a high school student in Point Pleasant, New Jersey. He began working at Mike's Subs at the age of 14. Peter loved working at Mike's. He loved authentic submarine sandwiches. But even more, Peter loved working behind the counter, interacting and talking with the customers. He liked learning about where they were from and their summer vacation experiences. He took pride in knowing which authentic sub sandwich his loyal customer would order as they entered the store. When Peter was a senior in high school, he overheard the owner of Mike's Subs discussing selling the business. He thought to himself, "I love the food, I love working in the store, maybe I'll buy the shop." Pretty ambitious for a 17 year old kid. Peter approached his football coach and said "Hey coach, Mike's Sub shop is for sale, and I'm interested in buying it. Can you help me out?" It didn't hurt that his football coach was also a banker. The football coach came through for Peter, and backed his loan. So, at the tender age of 17 – before he was legally able to slice a sub – Peter Cancro became the owner and proprietor of Mike's Subs. Shortly after buying Mike's, he married his former wife Linda and they opened a couple more local outlets of Mike's Subs. He expanded upon the phenomenon of Mike's Subs. Teaching the crew to interact and talk with the customer, to share a passion for getting to know the customer. He spent the next decade building on the cult-like following that Mike's Subs already enjoyed. They would have customers lined up out the door in the summertime waiting to get the authentic sub sandwiches that Mike's was famous for. In the mid-eighties, Peter heard more and more people say, "Peter, we're going to miss you and your subs this winter. We sure wish you would put a Mike's where we live!" People would come in at the end of the summer and get several giant subs wrapped for travel, to carry back to their homes across the country. This got Peter thinking, and he started researching the possibilities of franchising the Mike's concept. In 1987, Peter began franchising. He changed the name from Mike's Subs to Jersey Mike's Subs to capture the authenticity of where the authentic sub sandwich was born. Today, Peter Cancro is CEO of Jersey Mike's Franchise Systems Inc., overseeing more than 1,500 locations open and under development. Despite the title, Peter still jumps behind the counter to test his skills and demonstrate his passion for the product and the customer. He tries to instill that passion in every store he enters and with every franchisee he meets. Today, the authentic taste – served Mike's Way® with lettuce, onions, tomatoes, oil, vinegar and spices – is available nationwide. Our secret? Everything about Jersey Mike’s is high quality. Our MSA Grade top round beef are trimmed and cooked right in the store. Our meats and cheeses are all top-quality premium brands. Our bread is fresh-baked each day on the premises. And of course, everything’s prepared right in front of you. It’s what makes Jersey Mike’s the most authentic tasting submarine sandwich available, and it’s a tradition of quality we’ll never outgrow.